The Klamath & Western Railroad, Inc. is a registered 501 (C) 3 organization. Contributions may be tax deductible. Your support is welcomed and appreciated. 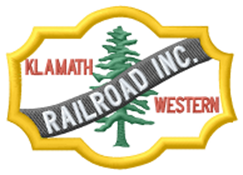 Membership in the Klamath & Western Railroad, Inc. is separate and different than the membership in Train Mountain. In order to operate the K & W equipment and haul passengers you must be a member of K & W and therefore qualify under the K & W insurance coverage. You can be a member of K & W without being a member of Train Mountain. There are no other requirements. The main purpose of the K & W group is the running of passenger service on the Klamath and Western Railroad. If you are interested in membership, please come out and enjoy the fun of running trains and watching all those great smiles from all the passengers on each and every Saturday, Memorial Day weekend through Labor Day weekend. We haul the public 17 Saturdays. If you are interested in helping us out we would love to see you for two or three of those run days. Members can earn run time on one of the clubs engines. Engine number 52 is being maintained and upgraded just for our members use. Members in the same household can accumulate their times for an even longer run time. Time earned can be used any time with prior arrangements. Check with any board member for details of the member run-time program. deductible. Your support is welcomed and appreciated. EMAIL: Klamath & Western Railroad, Inc.